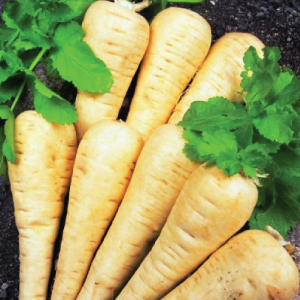 (Pastinaca sativa) Parsnip roots are long, white, and, after a hard frost very sweet and spicy. Parsnips can be stored well after a spring or fall harvest. Although they can be eaten raw, they are primarily cooked by boiling, baking, roasting, or used in stews, soups and casseroles. The All American Parsnip variety has a tender white flesh with a mild, delicate flavor that is a good, frost-resistant keeper. 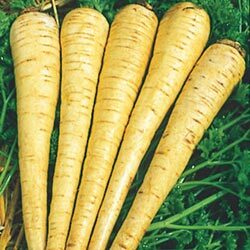 Hollow Crown Parsnip is a valuable winter food source that is best if eaten after the first frost as this causes them to produce more sugar.